We report the first screening for antioxidant activity (AOX) of three dominant seaweeds from low intertidal reefs of Brazil. 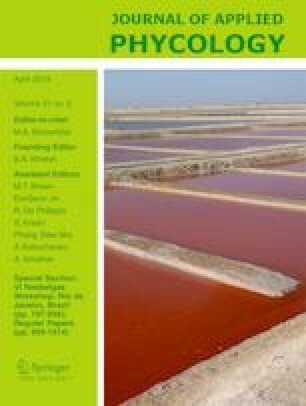 Sargassum furcatum, Bryothamnion triquetrum, and Osmundaria obtusiloba were extracted with dichloromethane and methanol (2:1), and AOX was measured by five UV-vis microplate spectrophotometric methods: DPPH (2,2-diphenyl-1-picryhydrazyl) and ABTS (2,2-azinobis (3-ethylbenzthiazoline-6-sulfonic acid)) free radical scavenging, metal chelating capacity, total phenolic compounds using reducing power by Folin-Ciocalteu and FRAP (ferric reducing antioxidant power). All studied species showed high AOX, even at very low extract concentrations. We can attribute these results to the stressful environment in which these seaweeds live, high hydrodynamics, air exposure during low spring tides, intense solar radiation, and other factors that may contribute to oxidative stress, featuring O. obtusiloba as a new source of natural antioxidants. This work was partially supported by research grants from the Conselho Nacional de Desenvolvimento Científico e Tecnológico (CNPq, Proc. 484647/2012-1). The first author thanks the Coordenação de Aperfeiçoamento de Pessoal de Nível Superior (CAPES) for the doctoral fellowship. MTF and FC thanks CNPq for the productivity fellowship (Proc. 304899/2017-8 and Proc. 303937/2015-7).